Sidelined is the second novel in bestselling author Marquita Valentine's Scored sports romance, although it can, more or less, be read as a standalone. I'm not entirely sure if the author does have the books together as a series because they aren't categorized as such on Goodreads, but it is marked as the second Scored book on iBooks, so at least I don't feel like a complete idiot. Either way, I will recommend that you read Scored as well, mainly because the main characters there, Dallas Drake and Paige Owens, are the teammate and best friend, respectively, of the main characters here, Aidan McHugh and Layton Price. Don't worry though, Scored was as fun a read as Sidelined. But let's focus on the book of the moment! 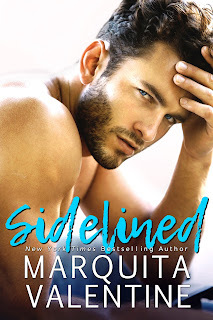 I adored Sidelined, which is, at its most basic, a falling-for-my-best-friend's-sibling story in the sports romance sub-genre. However, Valentine did such a fantastic job bringing to life Aidan and Layton and their offbeat love story, what with the thirty-five-year-old Southie with a less than stellar upbringing in Boston who is now a grumpy quarterback with the Raleigh Renegades and the twenty-six-year-old sassy Southern belle turned event planner who was about to marry the boy she knew she would spend the rest of her life with. And no, I'm not talking about Aidan. It all started a decade and a half prior with a very glittery binder. I don't want to give away the entire plot here because then, what would be the point in your reading the book? Let's just say that there's more to Aidan than you may think, and Layton needed to let go of her past if she ever wanted to have any sort of future with the guy who offered up to be her Plan B on the night they first met fifteen years ago. The story was cute and had me smiling like mad, and it was surprisingly not as angsty as I thought it would be, given what happened to Layton courtesy of Joe the schmo. You'd think an angst addict like me would be put out, but nope! There was just enough of it to satisfy me, and I loved the lighthearted feel of this fabulous tale. Learn more about Marquita Valentine. Purchase Sidelined on Amazon | B&N | iBooks | Kobo.